We have a media lab of the future right here in Syracuse, where the Syracuse Post-Standard is evolving into a “new newsroom,” where staffers have no desks or workspaces of their own and carry their own mini-newsroom on their backs. It’s a story worth following, as parent company Advance probably will be following this model at its other properties, too. And in many ways, it could well be a model for others, a model to follow — or avoid. It’s certainly an interesting idea with implications for how news organizations evolve, and how their employees work (happily, or not?). 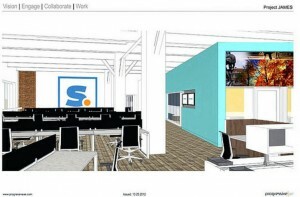 A sketch of the new downtown newsroom, as shown in The Post-Standard. The news operation gave itself a new name — The Syracuse Media Group — and a new location a half dozen blocks from the old one downtown. Stories about the shift emphasize the new space is a glass-front home where its news consumers are welcome to walk right in and talk to anyone. (I do wonder if this concept will change. Reporters who do their jobs well are plenty accessible to their sources and readers, and a little bit of security these days — at least requiring visitors to sign in, as they do now at the P-S offices downtown — does not seem like a bad idea.) And, sometimes, don’t you need some quiet and some space — literally some space — to get your work done? All of this said, with the apparent emphasis on being “out there,” will readers who walk in even find anyone there? What will draw reporters there, much less readers? Will there even be a coffee-maker? At the same time that Syracuse Media Group said goodbye to 115 employees (let go, bought out, early retirements, etc.) it noted it’s hiring 60. These are primarily — if not exclusively — much younger people who are said to possess the “new skills.” And, hopefully, they have some of the “old ones,” too, that will assure quality and accurate news reporting with a strong ethical compass and a devotion to, and understanding of, the basics of everyday news and long-term, investigative, watchdog journalism. The Post-Standard has long done a wonderful job of that. No one should presume that it will just continue. Syracuse Media Group has also emphasized a number of times over the past few months that while there has been a substantial net loss, there will be “more reporters now than before.” There is no reason to disbelieve this, but what it means is another thing. What is there less of? The front-page story in the paper this past Sunday declares “goodbye copy editors, hello curators.” It’s a catchy sentence, sure, but a scary one to any journalist who works at the P-S, or doesn’t. Most people have a hard time accepting what’s been common “math” in the news business the past few years: Declarations that shrinking staffs will not mean coverage cuts. In fact, oftentimes such revelations are accompanied by assurances that “that doesn’t mean we’ll be doing less.” We all understand that in a business heavily dependent on human resources, as the news game is, it is hard to do more with less. Probably impossible. This is not to suggest nothing is gained or improved by change — just a nod to the reality that something is lost when staffs are dramatically pared. All the best to the “new” Post-Standard. There are many dedicated, smart and hard-working journalists there. Indeed, they are working harder than ever, often for less. It will be interesting and informative to see how the “new newsroom” evolves and whether journalism remains a business that attracts the resources (people) it needs to excel. Very interesting concept. The no-editor thing throws up a huge red flag, though, and it makes the operation sound more like a loosely connected network of bloggers than a legitimate news organization. It\’s also important to note that the younger new hires will come on board with much lower salaries, which undoubtedly factored into Syracuse Media Group\’s decision-making process. I definitely share the concerns of both Steve Davis and commenter Colin Steele. I\’ve been blogging for a living, writing about the music industry, since 2005 and the hardest part, particularly in the early years, was the sense of isolation and the pressure of doing it on my own. Though I\’m ok at copy editing my own work in an idiosyncratic fashion, if I was working with a group or had higher visibility and worked at a faster pace, I\’d sure want a copy editor in the mix. Journalists with their claims to higher standards? I don\’t see how you do that without some copy editing and fact checking support unless the goal is to make the full shift to a post-journalistic stance on digital publishing. That\’s fine if that includes the executive level so they understand what that really means. But isn\’t the problem going to be that the people in charge, older and more powerful, will have their own offices and won\’t understand what\’s required in the field? Isn\’t it likely that they will have unrealistic expectations and that the few who can meet those will burn out?